For the last 12 years, we believe that Skinceuticals has been the market leader when it comes to researched skin products. They bought us research showing how Vitamin C serum on the skin would not only reduce the chances of skin cancer, but would also prevent the breakdown of collagen in the skin from sun-damage. They bought us the research to show how useful Resveratrol cream is proving to be in protecting us from skin cancer and potentially stimulating the SIRT 1 gene to extend longevity of cells. Now, even though their founder, Professor Sheldon Pinnell has passed away, they are happily still looking at new frontiers of research. Their latest foray is looking at the protective surface of the skin – the lipid bilayer and why it is important to protect it. We look at our skin every day and probably never spend a moment wondering why it doesn’t dry up in the sun and leave us looking like prunes. If we did, we would find out that our entire skin is covered in a very important lipid bilayer, which stops bacteria and toxins penetrating us and keeps our moisture inside us. If it gets damaged then it is the first to send messages to the basal layer of the skin to repair it. The process is not just a secretion of oil, but a reliance on the epidermal cells to release the contents of what are known as lamellar bodies onto the surface of the skin in a fixed pattern that leaves a strong, elastic protective barrier. Very clever stuff indeed and something that we take for granted: every time we wash with a strong anti-microbial soap, we strip this protective layer. Every time we swim in chlorinated water, we strip this protective layer. Every time we treat the skin with peels and lasers, we strip this protective layer. This is all fine as the skin can rebuild itself, but as we get older, we become less efficient at this task and can be left with dry wrinkly, inflamed skins. We might spend thousands on dermatological assessments of this, when all we need to do is look after the lipid bilayer a little better. We look after this lipid layer, by not traumatizing the skin quite as often, by including healthy oils into our diet and directly by applying products like the Triple Lipid Restore. Why does it have this name? Because it has 3 different lipids in it (Ceremides, Cholesterol and Fatty acids) in specific ratios that have been shown not just to health the surface but to accelerate the healing of the surface of our skins. 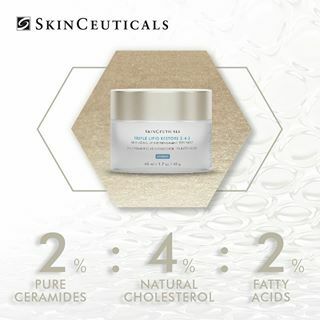 I hope that future research from Skinceuticals will look at the potential DNA damage that we do when we strip our lipid surface of the skin. I also hope that it will look at the flora of the skin – the bacteria that live on our skin. Just as we protect them in the GUT with probiotic capsules, I hope that one day we can protect our skin flora with probiotic creams. Until then, spend a thought for that hardworking skin that toils without complaining to keep you protected from this harsh world.